After only two posts, I failed at my week long blog-a-thon. Oops. Sorry if you stayed up all night last night just waiting for a post from me, and I didn’t come through. I hope we can still be friends. A couple of weeks ago, my two sisters-in-law (Jenn and Rach) ran the Hartford Marathon. It was the very first marathon either of them has ever run! Because Hartford isn’t super far from our house, Jeff and I decided to go cheer them on. I’ve never spectated a race before, so Hartford was a new experience for me, too. Because the race was 2 hours away, we decided that the best plan of action would be to leave at around the time the race started and see them for the first time at about the halfway point. The night before the race, I made some signs and we loaded up on snacks for the drive/waiting. Neither of us are familiar with Hartford, but Jeff studied the course map and google maps in preparation, and I was all set with the GPS. Sometimes, when I’m in charge of GPS I freak out a little, but luckily we found a great cheering spot very easily without me having to do anything. (Phew!) We ended up at around 12.5 miles into the race, and posted ourselves on the sidelines under an umbrella (it was unpleasantly cold and rainy). 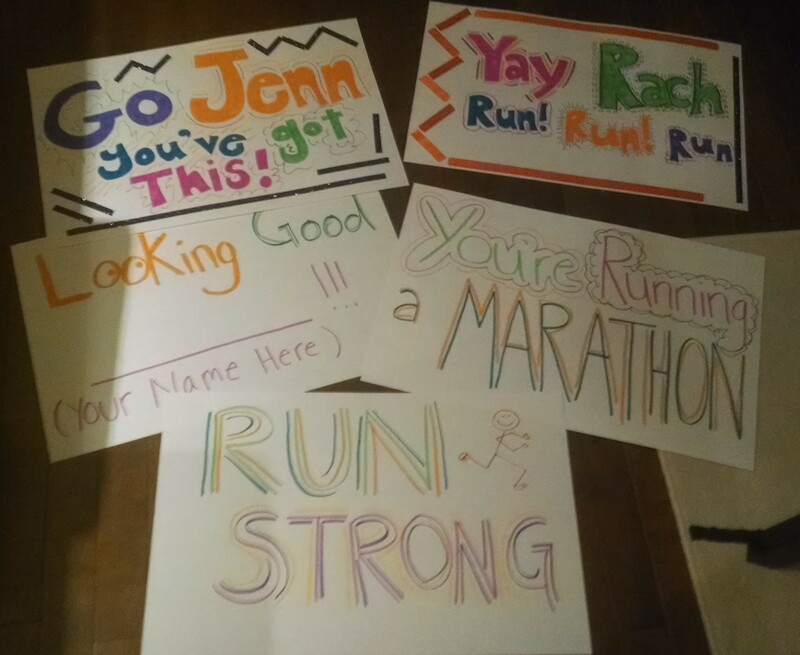 While Jeff tried to figure out when we might see our runners, I was awkwardly yelling motivational cheers and holding my awesome signs! One runner even came over and gave me some trash to throw away for him. Yay! Talk about making a difference! Then out of no where I heard someone yell my name. Ooops! We almost missed Jenn. Luckily, she was on top of things. She had come by sooner than we thought, and was looking really good. I didn’t have time to switch to her special Jenn sign, but she gave me a heads up that Rach was right behind her, so a few minutes later, we were better prepared when Rach came by. Rach was also looking great at that point, and seeing them both was so exciting! 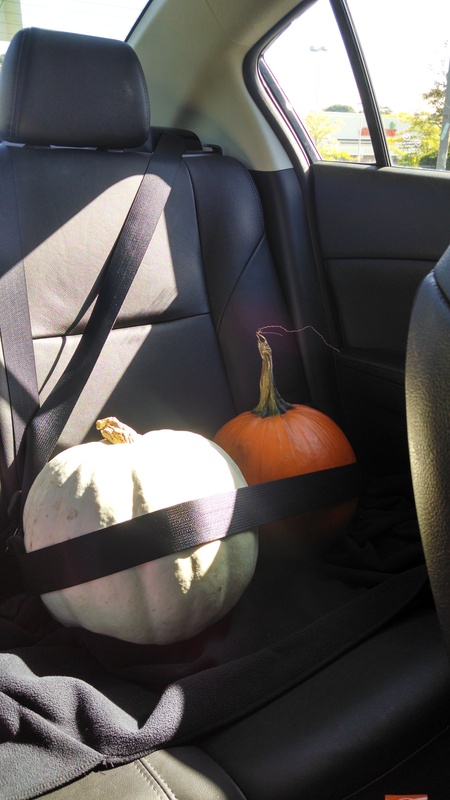 I didn’t take a lot of pictures at the race…so here’s one of our pumpkins buckled into the backseat of the car! After we’d seen Jenn and Rach, we headed back to the car. It wasn’t great weather for spectating, so we had some snacks, and read the books we brought along. About 45 minutes later, we took a short walk over to where the runners would be looping back towards the finish, mile 21.5. This time I tried EXTRA hard to pay attention so we wouldn’t miss Jenn. It was still a close one. She came out of nowhere! I had time to switch from a generic sign to the Jenn specific sign, but I dropped the generic sign in a puddle in the process. Once Jenn zoomed past us, we continued to cheer until we saw Rach. Both Jenn and Rach were still looking strong which was a great relief. There were definitely some people struggling quite a bit at that point. After Rach ran by, we high tailed it back to the car so we could get to the finish before Jenn. And again, we made it JUST IN TIME. As we showed up at the finish chute, Jenn was coming out. I can’t believe how close we were to missing her several times. We are very efficient spectators…no time wasted! We hung out with Jenn for a bit and met up with some other members of her fan club before splitting off to cheer for Rach as she crossed the finish line. Both Jenn and Rach did AWESOME! And before I knew it the whole thing was over. In addition to the two of us, the fan club also included their parents, their husbands, and my niece. We didn’t meet up with the rest of the fam until the end of the race, but we all went to lunch after and got to hang out a bit. All in all, it was a pretty fun day. I would definitely spectate again. Cheering for Jenn and Rach was really fun, and cheering for strangers was okay, too. I’m not a super loud person, so yelling out to strangers was a little bit of a challenge, but the runners all really appreciated the support. I only did one really awkward thing. At one point, a runner yelled out to me “Is this the finish line, here?” and I awkwardly answered “Nah, you’ve got a ways.” Probably not the best thing to yell to runners at mile 21.5. My bad! I was already struggling to come up with things to yell (you’d think it would be easy), but having to actually respond to someone was obviously too much for Ms. Awkward (that’s me). All in all, I had a good time. Jenn and Rach had a good time. Success! Have you ever spectated? Do you find being loud stressful? I’ve never spectated a race–if I’m at a race, I’m running it. Although I will sometimes hang around at the finish line after I finish and cheer other runners. I have no problem with being loud, though, I’m a theater kid! Yeah, this was the first race I’ve been to that I haven’t been running. To be honest, I almost signed up to run one of the shorter distances before spectating, but decided against it because I would have had to get up way too early. I felt sooo awkard cheering! I was nervous, and would freeze up and not know what to yell. I kept nudging my husband to ask what I should say. I never said “almost there” because I know that can be so awful if it’s not true, but I’ll have to cut spectators some slack from now on.